The Millennium Prize Problems are seven problems in mathematics that were stated by the Clay Mathematics Institute in 2000. As of October 2015, six of the problems remain unsolved . A correct solution to any of the problems results in a US $1,000,000 prize (sometimes called a Millennium Prize) being awarded by the institute. The Poincaré conjecture was solved by Grigori Perelman, but he declined the award in 2010. Out of the six remaining unsolved problems, the Riemann hypothesis has recently been solved by a Nigerian scholar. 1/2. The name is also used for some closely related analogues, such as the Riemann hypothesis for curves over finite fields . 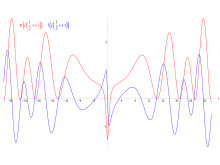 The Riemann zeta function ζ( s) is a function whose argument "s" may be any complex number other than 1, and whose values are also complex. It has zeros at the negative even integers; that is, ζ( s) = 0 when "s" is one of −2, −4, −6, and so on. These are called its trivial zeros. However, the negative even integers are not the only values for which the zeta function is zero. The other ones are called non-trivial zeros. The Riemann hypothesis is concerned with the locations of these non-trivial zeros, and states that: The real part of every non-trivial zero of the Riemann zeta function is 1/2. Dr. Opeyemi Enoch is reported to have solved the problem that remains unsolved for the past 156 years. "He also showed how other problems of this kind can be formulated and obtained the matrix that Hilbert and Poly predicted will give these undiscovered solutions. He revealed how these solutions are applicable in cryptography, quantum information science and in quantum computers", it stated. You can be $1,000,000 richer if and only if you will pick one of the remaining unsolved problems to solve and give us a generally accepted solution with proof. One of it is the Birch and Swinnerton-Dyer conjecture.